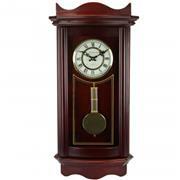 This Bedford Clock Collection handsome wall clock features a weathered cherry finish. Flat top, distinctive columns with corbels framing the door, and carved moldings that accentuate the pediment. Circular spun antique polished dial with black Roman numerals, hour markers, and hands. An antique polished brass inspired pendulum with grid hangs below. A melodic hourly chime adds to the charm of this distinctive wall clock which is sure to be a lovely addition to your home or office. Has 4 chime modes and volume control toggle.